If you’ve recently been diagnosed with type 2 diabetes, you’re probably feeling overwhelmed. After all, being diagnosed with any chronic disease is overwhelming – but having diabetes may mean a change in diet, lifestyle, and a myriad of new medications. There is a lot to know, and it is likely that your provider discussed much of this information – or referred you to speak with a certified diabetes educator (CDE) and a registered dietitian (RD) to learn more about your condition. It is a great idea to talk with both providers because they can provide individualized education. If you continue reading, you’ll find a guide to what type 2 diabetes is. It provides basic information about your condition. A straightforward explanation of type 2 diabetes is that your blood glucose levels run too high. However, if you have type 2 diabetes, you know that this explanation is much too oversimplified. Our pancreas produces insulin. Ideally, our bodies produce the perfect amount of insulin. The insulin acts as a “key” to guide the glucose into the cells, and the cells transport the glucose where it can be utilized for energy. Type 2 diabetes then occurs when the pancreas doesn’t produce enough insulin, or the body does not use the insulin effectively. This causes blood glucose levels to become elevated, and the glucose is unable to reach the cells of the body, where they would be used appropriately. Although both types of diabetes require monitoring and management of blood glucose levels, there are some stark differences type 1 diabetes and type 2 diabetes. Type 1 diabetes occurs in five to 10 out of 100 people with diabetes. It is an autoimmune disease, which means that the body’s immune system destroys its insulin-making capabilities. Eventually, the person with type 1 diabetes will be unable to make any insulin, whatsoever. This means that they will have to give insulin to survive. It most commonly occurs in childhood but can occur at any age, as it is an autoimmune disease. As discussed, both types of diabetes require careful monitoring of blood glucose levels, as well as management of levels. Both types can also increase the risk of complications if those levels are not carefully controlled, which we will discuss in greater detail. Often, diabetes is called a “silent” disease. Why? Because in some individuals, it can occur for a long time before symptoms manifest. Often, these symptoms of diabetes may be mild at first and then worsen over the course of time. Occasionally, people have no signs whatsoever! Sometimes, an individual may not be diagnosed with diabetes until they develop a complication of their disease. A variety of tests can be performed, if a diagnosis if type 2 diabetes is suspected. For the person who regularly attends the doctor, they may also be screened for type 2 diabetes at frequent intervals. Your physician may order one of these tests at a routine screening. You might also like...What Are Some Common Myths About Type 2 Diabetes? Glycated hemoglobin (A1C) is a blood test that measures your blood glucose levels for approximately the past three months. It measures the glucose molecules that attach hemoglobin. If your blood glucose levels have been running higher, your A1C will subsequently be higher. Normal: A1C less than 5.7%. Certain conditions may render the A1C test inaccurate, such as having a hemoglobin variant or pregnancy. In these instances, your physician should then order a different screening test. 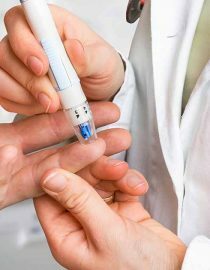 A random blood glucose test involves a blood sample taken at a random time. Regardless of what was eaten and when, a blood glucose level higher than 200 mg/dL (11.1 mmol/L) is indicative of type 2 diabetes – especially if any of the symptoms listed above are present. Next page: More tests that aid in diagnosing type 2 diabetes, the causes of type 2 diabetes, and diabetes treatment options.